BuckeyBites All Natural Antler Chews are all natural dog treats. But they are so much more than just a treat. They have been nature’s “perfect chew” for the K9 population as well as other animals since the dawn of time. • They help to promote the dental health of your pet. 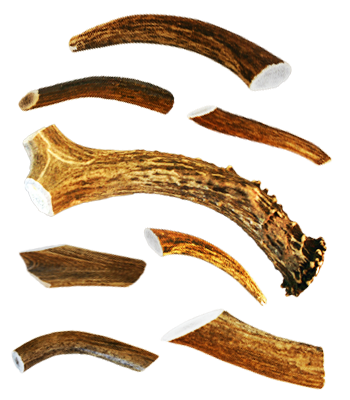 • All of our antlers come from North American shed antler – never anywhere else! • Your dogs will love them! BuckeyBites All Natural Antler Chews are 100% shed antlers. This means that no animals are harmed in the collection of our products. Deer and elk naturally shed their antlers once a year and re-grow them annually. For this reason, shed antlers do not provide a large supply for the market making them highly coveted by pet owners as well as the dietary supplement industry. It is nature’s way of providing a highly beneficial byproduct of the natural wild. We use only the highest grade of North American shed antlers. Your pet will love chewing on a variety of different size and shapes. BuckeyBites All Natural Antler Chews are much different than traditional chew products found on the market today. They not only last much longer, but they also provide essential minerals for your pet, helping to maintain and support their overall health and wellbeing. Warning: Always supervise your pet when chewing any chew product including antlers and do not let your pet chew antlers unattended. Take antler away from your pet if it becomes a swallowing or chewing hazard. If any small or sharp piece breaks away from the antler, you should immediately remove it from your pet. Dogs love our antlers. Dogs also love our Hemp Rope Dog Pull Toy with Antler Chews too. Made from natural hemp rope. Hemp is digestible unlike many of the common chews made from vinyl ropes or cotton blends. This is the perfect chew toy. Hemp rope toys for dogs are the perfect chew toy for cleaning teeth. They also help to message the gums. What makes this rope toy even more special is the addition of our high quality antler chews which not only acts as a convenient handle for either you or your dog, but also adds additional nutritional value. Antler chews are nature’s perfect chew for small and large dogs. Cut from 100% North American shed deer or elk antler. No animals are harmed in the collection of our antlers. They provide an excellent source of minerals, and calcium for your pet. They support bone, joint & muscle health. Non-allergenic and 100% natural, odor free. And….they last much longer than traditional chews. We are asked from time to time if the hemp rope will make dogs high. The answer is no. Hemp is not like its cousin plant and will not get a dog or a human high. You might find that your dog might start wearing a peace sign and sandals though! Your dog will love Buckey Chew Pulls. 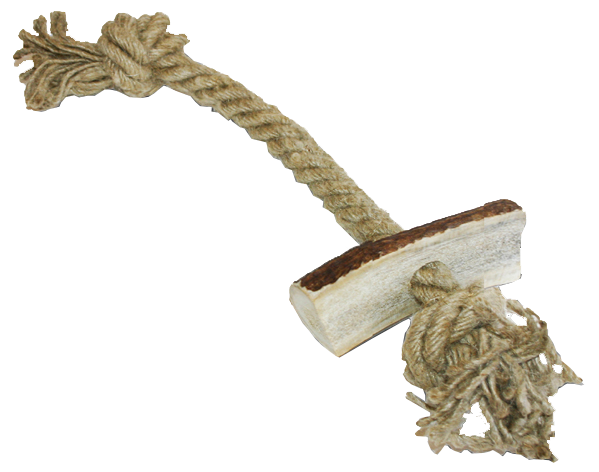 Give one to your dog today and enjoy quality time with your pet – together “playing tug a war” or just letting your pet “have at it” and chew away on this excellent, natural pull toy! Available in both small and large sizes for both small and large dogs. • Excellent source for essential minerals. • Excellent for teeth & coat. • Helps with the health of joints & kidneys. • Non-allogenic and 100% natural. • Collected and cut in North America. For your convenience, we have provided our Chew Size Chart below. BuckeyBites All Natural Antler Chews can also be chewed by puppies. Puppies would fall into the 0 -15 lbs. category. 1. Are any animals harmed in the collection of BuckeyBites antlers? No! BuckeyBites All Natural Antler Chews are 100% shed antlers. Deer and elk naturally shed their antlers once a year and re-grow them annually. For this reason, shed antlers do not provide a large supply for the market making them highly coveted by pet owners as well as the dietary supplement industry. It is nature’s way of providing a highly beneficial byproduct of the natural wild. 2. What benefits do antlers present? BuckeyBites All Natural Antler Chews are completely natural. They have been nature’s “perfect chew” for the K9 population as well as other animals since the dawn of time. They provide an excellent source of minerals and calcium which support the overall health and well being of your dog. They are particularly helpful in the support of bone, joint and muscle health. Since they are 100% natural, they do not contain any chemicals or preservatives. They are also non-allergenic and your dogs will love them. In addition, BuckeyBites All Natural Antler Chews help to promote the dental health of your pet. Again, they are nature’s perfect natural source that help clean and maintain your pet’s dental hygiene. 3. What essential minerals are in BuckeyBites All Natural Antler Chews? 4. What type of animals contribute their shed antlers for BuckeyBites? We use antlers from deer and elk in A grade (a rich brown color), B grade (brown on one side and somewhat white on the other) and C grade (white in color as parched by the sun). 5. Is there a difference in the nutritional value offered in either A, B or C grade antlers? No, not at all. The different grades offer all the same amount of nutritional value for your pet. 6. Do BuckeyBites last longer than other type of chew products offered on the market today? Yes, they last at least four to five times longer than traditional chew products currently offered on the market today. 7. What if my dog does not immediately take to BuckeyBites All Natural Antler Chews products? The introduction of BuckeyBites may be initially foreign to domesticated animals. If your pet seems to be cautious of their introduction, a simple and healthy solution can be offered with the addition of some peanut butter to the antler (unless of course your pet is allergic to peanuts). Simply rub a little on and watch your pet go to town. 8. I gave my dog a deer antler first and she didn't seem to take to it as well as the split elk antler. Why is that? Domesticated dogs should be properly introduced to antler chews. We recommend that you start your dog off with a split elk antler. The marrow of the split elk antler is exposed and easy to access for your pet. They can immediately start enjoying the taste and benefits of the antler chew with the marrow exposed. Once properly introduced with this starter antler, your dog can then be introduced to a closed elk split antler. Ultimately, your dog can be given a closed dear antler. The closed deer antler will last the longest and give your pet the most out of their chewing experience. Remember, if your pet is not initially interested in BuckeyBites All Natural Antler Chews, smear a little peanut butter on or rub a little beef broth on it (unless of course your pet is allergic to peanuts). Please do not soak the antler in broth for an extended period as this may cause leakage onto your floor. BuckeyBites All Natural Chew are collected and packaged in North America. Buyers of our products can be assured that they are not purchasing product that was collected or farmed in overseas companies. Once the antler is collected, it is inspected to make sure that it meets our quality control standards. It is then cut into their appropriate sizes and then sanded to insure that they are ready for your pet’s consumption. All products that we provide are processed, labeled, inspected and packed in the United States. BuckyBites All Natural Antler Chews are pet treats for dogs. They last longer than regular dog chews and provide an excellent source of minerals and calcium. Copyright © 2018 Buckey Bites, LLC. All Rights Reserved.